Su excursión de día completo por el legendario Medio Rin comienza por la mañana con la salida desde Koblenz. Vaya al punto de embarque, cerca del Deutsche Eck en el paseo del Rin, y suba a bordo del barco romántico Goethe de KD. Este barco de vapor ofrece una experiencia y un ambiente únicos para todos. Regrese en el tiempo a la década dorada de los veinte paseando por los salones del barco, adornados con un estilo art decó. Siéntese cómodamente, tome un café o un té en la cafetería del barco (no incluido en el precio) y admire las impresionantes vistas de los sitios principales junto al río. La Ruta nostálgica le llevará por enormes castillos, magníficos viñedos, el risco Lorelei y mucho más. El recorrido de 11 horas le lleva al punto de partida en Koblenz al atardecer. (Le rogamos que consulte la sección del itinerario más abajo para conocer el horario actual). Muy interesante y llamativo. De gran belleza y asombrosas vistas. Es sorprendente el trafico del Rhin, barcos y barcazas con distintas cargas. En mi caso, no se pudo descender y conocer los pueblos ribereños, sin sacrificar llegar al final del recorrido. Muy recomendable. An amazing time on the boat, the slow moving boat gives you time see all the sights, the towns castles and more, fall colors where wonderful, i would recommend this cruise, plenty of room on the boat, we even ate on the boat, the food was good. Tour operator had people arriving at the same time at our meeting location. He had to take the people with one half day trips to Neuschwanstein Castle first. He said he would be right back. He shows up at 9:20 am tour was supposed to start at 9:00. We had to go back to the castle to drop off two more people with one-half day trips. Now we are an hour late for our all day tour. The first stop was supposed to be Linderhof Palace. The route we took had a bridge that was out and this caused us another 45 minute delay to go around the mountain in a different direction. We toured the castle and when we returned, he said that he could only drive us through Oberammergau because of delays and the fact that our tour at Neuschwanstein castle was at 2:50. So we drive through Oberammergau instead of being able to visit the town, and then we are on our way again. Then we get about 5 miles out of town and he realizes that he should have filled up the tank with gas and we had to drive back to Oberammergau for gas. We booked the trip so that we could walk around Oberammergau and he seemed to think it was not important. More time lost. The van was not comfortable, windows not clean, and it was difficult to find the seat belt connectors due to a seat cover. The driver drove way to fast and it was scary. We have booked trips through Viator since 2005, and this is our second bad experience in two out of our last three trips. It seems the quality has gone down in that time frame. We will not use this service again. We started the tour in Boppard and it was a perfect length for the cruise. We didn't wait for the paddle boat but took one of the others and it was still a great boat. We enjoyed the scenery and the service on the boat. Would recommend this to anyone interested in seeing the castles along the Rhine. We my husband, adult daughter, and I are so glad that we took this one-day trip. The price was right, and the food and drink on-board was good and reasonably priced as well. We opted not to disembark earlier, but I can see that being a good option for those who want a slightly shorter or more diverse day. We used the full day trip to catch up on some reading while enjoying the castles, towns, and vineyards and the stories behind them. A shorter 3-4 hour? trip would have been plenty if our main objective was sight-seeing. The all-day pass is a good value, but be aware that you probably can't see the entire route and get off at a couple stops unless you commit to starting first thing in the morning at Koblenz or Rudesheim, and sticking around all day. The schedule is available on this website. The Subway on board our boat was not open until after noon, but there were snacks available on the top deck. The tour itself is nice. A recording presents information in a few different languages. Also - on our specific day, there was an American woman who ruined the entire experience for a lot of us because of her obnoxious yelling about the Subway not opening when she wanted it to and her children being out of control. Kids are kids, but hers were screaming inside the restaurant and she was nowhere to be found. Meanwhile, she was yelling at crew at the top of her lungs. As a fellow American, I was embarrassed by her idiocy and how the crew neglected to handle the situation. They could have removed her from the boat at the next stop, but she carried on and on for over an hour. If you read a really negative review from the end of June 2017 about how the Subway wasn't open, do not heed it. She literally cursed me out for asking her children to be quiet and for asking her to calm down so that we could enjoy our cruise. No wonder Europeans don't have the best view of Americans. It was a wonderful day of cruising past vineyards and castles, and beautiful cities. We were on the paddle boat and it was elegant. We ate a delicious lunch and met some very interesting people. We met people from all over the world. We were safe and saw some terrific views. We could have hopped on and off to another boat and toured in a city, but we would have lost the paddle boat then. It was so much fun. 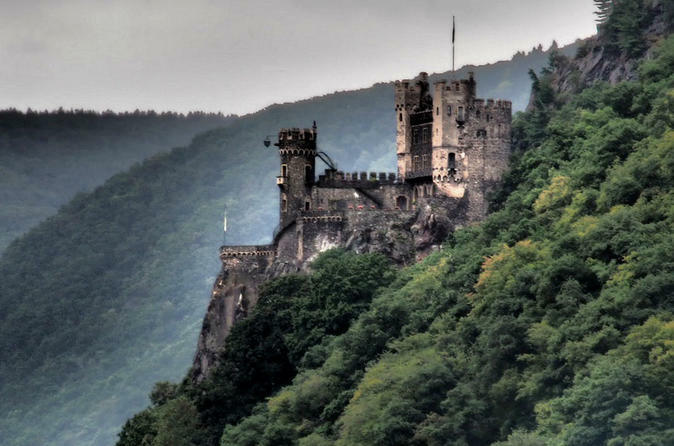 This is a wonderful one-day tour along a beautiful stretch of the Rhine. A must do! we had an enjoyable day. 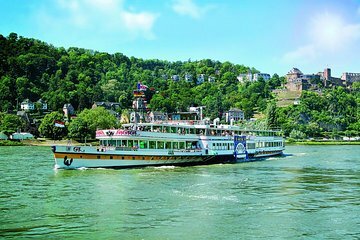 This is a great cruise to see all the castles and beautiful landscape along the Rhine River in 1 day. If you don't want to stay on the cruise to the end you can get off anywhere along the way and take the next boat going back to your original destination. I highly recommend this cruise.